Book a seat on our Community Bus offering a round trip door-to-door pick up and delivery service from Almurta, Anderson, Bass, Corinella, Coronet Bay, Glen Forbes, Grantville, Kilcunda, Pioneer Bay, Tenby Point and The Gurdies for 3 hours in Wonthaggi and back home again. Live in another nearby town or area? Call anyway – arrangements might be possible. 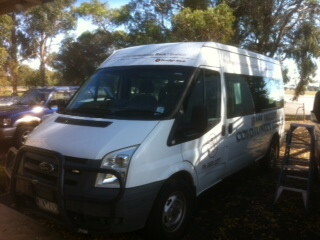 Each Tuesday and Friday, we operate a no fuss 3 hour round trip into Wonthaggi and back again. Our local bus service gives local residents of Bass Valley and the Waterline an easy opportunity and the means to access the nearby bustling township of Wonthaggi. 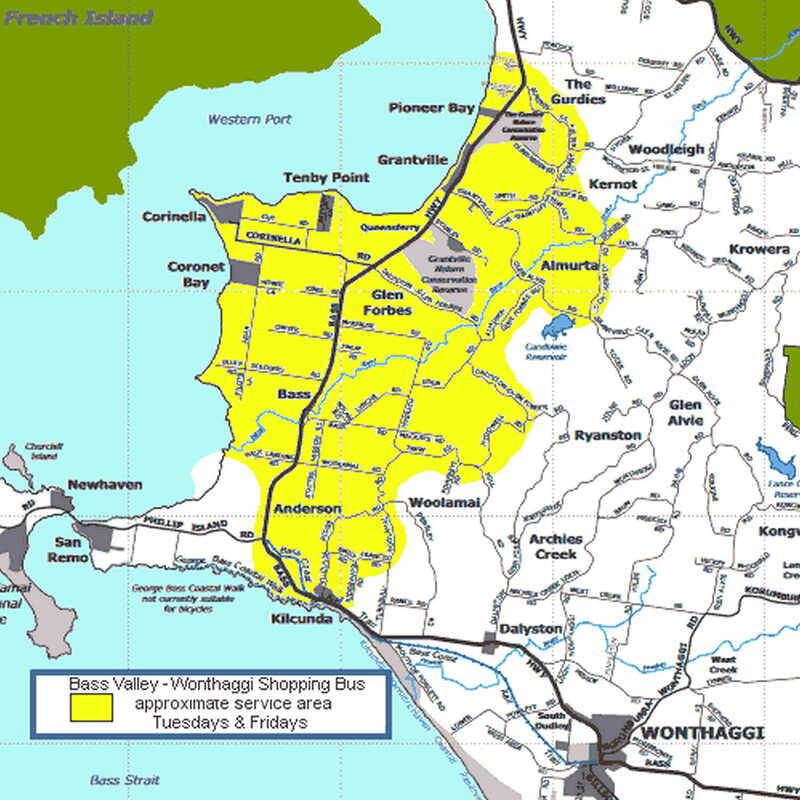 Wonthaggi is home to a large resourceful array of shops, services and advanced services. Explore and discover Wonthaggi’s many popular branded signature stores such as Coles, Safeway, Aldi, IGA, Target, Big W, The Reject Shop, Best and Less, EB Games, Priceline, Bunnings, Capeview Mitre10, Repco, Autobarn, Supercheap, Jaycar, Goldmark, Tattslotto, Bakers Delight, McDonalds, KFC, Subway as well as numerous other outlets, specialty stores, shops and cafes like the Ionion Fish & Chip shop, the Whistle Stop Bakery Cafe or purchase choice cuts from local butchers selling locally grown meats. Not to forget the multiple choices for home builders, pharmacies, doctors, dentists and various health specialists and, of course, requisite government services including Centrelink, Bass Shire Council offices and the Bass Coast Health Dental Clinic to mention a few. Note: We will collect you from your door step and drop you back at your doorstep. Need help getting your shopping inside? Yes, we will help with that too. That’s fine local service and we cater to all those in our neighbouring towns and areas! Not sure if this includes you? Call and ask. Refer to our service map below for our approximate service boundaries. Our pick-up and drop-off service runs each Tuesday and Friday. Take advantage of our door-to-door pick-up and drop-off shopping bus service. Our driver will pick you up from the comfort of your home and transport you in our very own modern, air-conditioned and heated 12-seater community bus. Help with bringing in your shopping is offered for those who need extra assistance. Regular or casual shoppers are all welcome. Advance bookings can be made or simply call the day prior to enquire about pricing and to book. Book your seat or enquire today by calling 5678 2277. The BVCG community bus arrives in Wonthaggi at 10.30am and departs Wonthaggi at 1:30pm. For convenience, the bus remains parked in front of Safeway on Billison Street at the supermarket entrance during these times. This community service is brought to you by the Bass Valley Community Centre, 2-4 Bass School Road, Bass. On Mondays and Wednesdays, we collect you from your door step and drop you back at your doorstep so you can participate in our HACC Friendship Program (see our Community Care page for more information). That’s service! Servicing all nearby towns and areas! Not sure if this includes you? Call and ask. Looking for public transport timetables, local taxi services or ferry & barge services?